A fairly new restaurant, opened up in the heart of Soho in February 2012. It has since been compared to the likes of Arburtus, but Mele E Pere isn’t quite there yet. The founders of Mele E Pere were chefs at the Michelin-stared Wild Honey back in 08′. Mele E Pere in English is Apple and Pear). This also may no longer be on the menu either, but it was my favourite sharing dish. Snails in batter with, I think, guacamole dip. Chewy and tender, great taste. 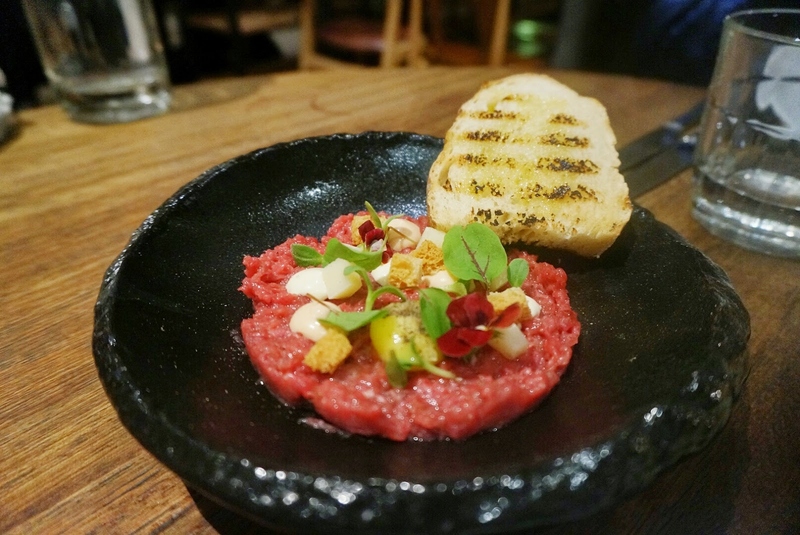 Hand chopped beef tartar. Not bad not bad. I really liked this one, the dip that came with it was so tasty and succulent. It’s a shame that this encounter was a while back so I’m not equipped to really describe this to you. I would definitely give this restaurant another go despite some poor experience with the mains. My brother Nelson, had the blank ink squid pasta, I thought it was too salty, but he liked it. Do give this place a go! Very promising dishes on the menu. (They do 2, 3 course deals as well as set party deals). Service: We came at a very odd time, so the restaurant wasn’t busy. Nice staff, and attended to my complaint well. The main dining area is downstairs, whereas upstairs you eat on high stools and tables with a bar area. Very over lit. Wear sunglasses.